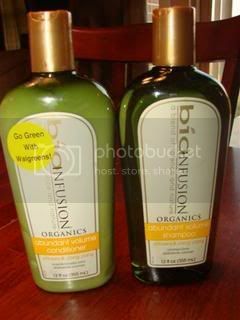 I purchased Biofusion Organics Shampoo and Conditioner at Walgreens due to their Free After Rebate offer. I’m always up to try something new. Sometimes, I wonder why especially after trying this horrible combination. First of all, the fragrance of this shampoo and condition smells sort of minty but not in a good way. In almost a dog shampoo way. The shampoo did not leave my hair feeling clean but it felt really stripped. The condition did not leave my hair feeling silky soft even when I tried using half the bottle. When I went to style my hair, my hair felt really thick and greasy even using normal amounts of this condition. By the end of the day, I looked even more like a greaser than normal. (I have really greasy hair.) It felt heavy and weighed down. Overall, I was glad I didn’t actually pay for this and I threw it out before I finished it, which I never do. Even if they pay me, I won’t try this shampoo & conditioner again.